In today’s society our calendars are full, our brains are overloaded, and our health is sometimes overlooked. Luckily, something we see in the mirror every day can be a good barometer for overall health…our mouths. Good oral health habits could lead to a healthier you. Remember teeth need to be functional first, then you should focus on aesthetics. Dental procedures, such as teeth whitening, (bleaching) should only be done on healthy teeth. Brushing your teeth and flossing daily is more than just something to check off a to-do list, it is an investment in the future. Multiple studies have shown oral conditions such as periodontitis, an infection of the gums, to be linked with a number of diseases, including heart disease and premature birth weight. The good news is that periodontitis is typically caused by poor hygiene, which makes it highly preventable by simply taking early action. Brushing your teeth in the morning and again before bed is a crucial component to good oral health as it prevents bacteria build up. In addition to that, flossing daily can be responsible for up to forty percent of the work required to remove plaque and bacteria from teeth. While these home efforts are a critical part of an oral health regimen, it cannot take the place of seeing a board certified dentist every six months for regular checkups. If you think that bad oral hygiene can be fixed completely with teeth whitening, think again. It’s actually quite the opposite. The better the condition of your teeth and gums, the more effective professional teeth whitening techniques become. People are undoubtedly diverse, and so are the shades of their teeth. Some may be born with less than perfectly white teeth. For others, repeated consumption of wine, coffee, soda, and tea can all take a toll on teeth yielding a less than flattering yellow effect on once pearly whites. Professional teeth whitening procedures are generally able to provide a noticeable difference. Unfortunately, dark yellow stains on teeth caused by smoking, chewing tobacco, or gray stains often caused by overuse of antibiotics are not as easily addressed. Those stains tend to permeate to the inside of the tooth, making them extremely difficult to be removed by teeth whitening. The best way to avoid finding these stains on your teeth may be to abstain from smoking and eating/drinking staining foods. Refrain from antibiotic use, especially during pregnancy. Teeth whitening can be achieved to some degree by over the counter aids that are lower strength. That said, it is important to note that none of these over the counter products have ADA approval because when a customer applies something themselves, they alone take on the responsibility for problems it may cause. Even if these products are used correctly, customers are generally not aware of their own potential oral health problems such as gum disease, exposed roots, sensitivity and more, unless they’ve been under the care of a qualified dentist. Teeth whitening while experiencing any of these conditions can, at the very least, cause great discomfort and at worst, permanent damage to your overall oral health. Some facilities operating without a licensed dental professional do offer teeth whitening. In general, these facilities offer patients the use of generic bleaching trays to achieve whiter teeth. The drawback is that no two bleaching trays should be just alike, just like people’s mouths. 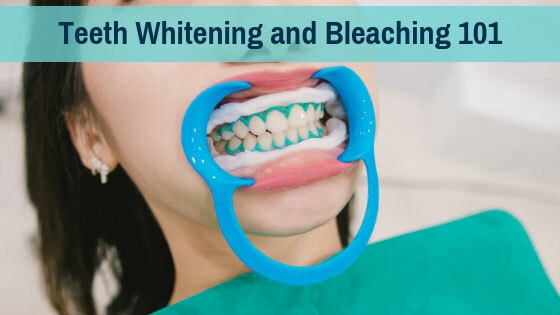 So, if a generic bleaching tray shape is given to all patients without any customization, it can create a trap of sorts where bleaching material can sit on the gums and cause short- or long-term damage to tissue, particularly gums between teeth. While visits are not typically covered by insurance, seeing a board-certified dentist before you look in to teeth whitening can keep you from doing irreparable harm to your oral health. A dental professional will begin with an extensive orientation about the teeth, followed by a thorough dental exam and x-rays. Only x-rays will show decay between teeth, which can impact the effects of bleaching and cause serious problems. Trays do matter. No two people’s mouths are the same, and neither should their bleaching trays. A properly cut bleaching tray will not be straight at all, but will be professionally customized by taking an impression. This keeps the tray from becoming shorter or longer than the gum line, which can allow bleach to collect in the wrong places. A good tray should fit like a glove and be cut just to the gumline to prevent further issues. While some home kits do offer kits with impressions, it is important to note that the customer takes on the responsibility when they do the impression themselves, and bad impressions can cause a number of very serious problems. The materials make all the difference. Over the counter bleaching products typically contain about ten percent hydrogen peroxide. Hydrogen peroxide in a bottle has about 3% strength. Carbamide peroxide at twenty percent strength is often used in at home use, preferred for patients with higher tooth sensitivity. However, since it is equivalent to 3% hydrogen peroxide it needs to stay in contact with teeth for hours. Carbamide peroxide can take two hours to activate and will work for up to six to eight hours. For this reason, dentists typically send patients home with plastic syringes to apply bleaching material in a single dot in the center of the front portion of their personally customized tray so that the solution will evenly spread over the teeth. The tray is then worn for an average of 30 min with hydrogen peroxide and with Carbamide peroxide for six to eight hours while the patient sleeps. The process is slow but yields beautiful results over time. The highest percentage of hydrogen peroxide that can be used is closer to forty-two percent strength, and that can only be used in a licensed professional’s office with properly placed protective materials over the gums. It is done under close supervision of the professionally trained staff. In this age of instantaneous gratification, it is important to remember that most teeth whitening procedures will not yield instant and tremendous change. Often, the process will give way to a shade that is two to three shades lighter, depending on stains and original color of the teeth. Often people have unrealistic expectations when it comes to tooth whitening. The best way to look at it is: if your teeth bleach about one shade lighter than the white of your eyes it is noticeable. If you are doing at home treatments you may consider doing only one arch first so you can see how much the shade changed. Once your teeth get lighter, do the other arch. The absolute best thing you can do for your teeth is to proactively practice good, daily oral hygiene to protect your health and keep your smile bright.